Have you seen me lately?" I wish I knew how to explain it, but then again, maybe I don't. The price of knowledge is knowing, and I suspect that when confronted with the actual answer to how this happened, it would not make me any happier, any less confused, any more accepting of what actually happened on this day. I can get mad at myself for once again allowing hope to creep into my soul, despite knowing well what has happened over the last two decades in this rivalry, but hope dies last. Hope makes stupid choices because, without it, there wouldn't have been any reason to watch those seasons that are not so long ago. I have seen suggested that Michigan is unable to get over the hump because the fanbase does not demand more of the players and coaches. I've been trying to process that for hours. I don't quite understand how Michigan fans failing to demand more of the players and coaches could lead to this series of results? Would it be that we have failed to overlook systemic wrongdoing by members of our coaching staff just because they win games? Would that be demanding more of our coaches? Because I mean, I could see where one might think that could work. That's really what bothers me. As an adult, you can know just how truly unjust the world is, you need only be vaguely conscious to understand that life is not fair, that the good guys usually don't win, and that wrongdoing is rarely punished on a scale appropriate to the crime. So if sports serve as a microcosm of life, it would only make sense that the same things would happen in the sporting world. So it made it exceptionally difficult to hear the redemption narrative that Gus Johnson was trying very hard to peddle about Urban Meyer and Ohio State this season, that Meyer's health issues allowed those who wanted to do so to wrap them around the larger issues of Smith's systemic failure as a manager of personnel and present a veneer of "You have to applaud what the Buckeyes have overcome this year." 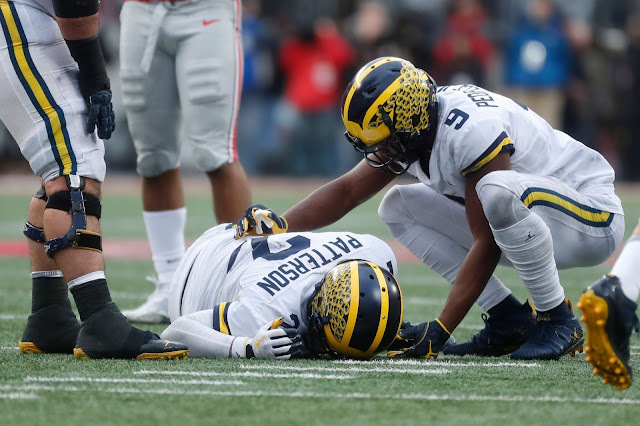 It was an insult to the spate of injuries Michigan suffered in the second half. More than anything, it would have been wonderful to change all of the narratives, to make the declining empire notions tossed about seem laughable, but today was not only not that, it was just depressing as all hell. I know damn well I should not care about this as much as I do, but I also know that this thing is a thread that has provided so many connections and moments of for me and for my family and friends. It shouldn't matter and yet it does, and it brings me back to where we started today, I wish I knew how to explain it, but then again, maybe I don't. She said "Everybody loves you, "
23 in a row overall. 20 in a row in the Big House with an average score of 38-15. But dang it if every single one of those feels like one of the most annoying wins of the year. But the key word there is wins. The only significant streak that has passed down the great chain of being of Michigan football from Bump to Bo to Mo to Lloyd to RichRod to Hoke to Harbaugh is that Michigan does not lose to Indiana at home (even more amazing, Michigan doesn't lose to Indiana on the road. It's only ever happened twice: 1959 and 1987, that's the list.) But the critical thing here is that they are wins. History rarely asks you how you won, but rather did you win? That does not deprive us of the narrative in the moment, because in the moment, dang this was annoying. 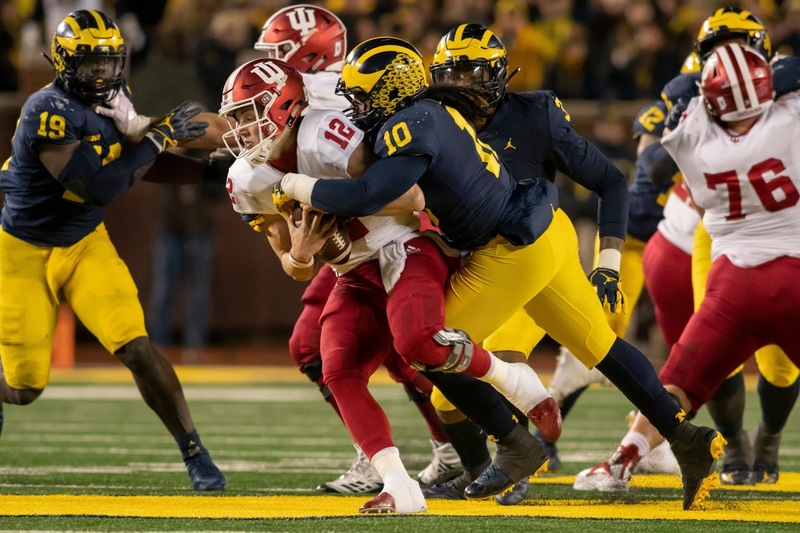 As I say so often, college football only lives in the past and in the future, never in the present so it can be reasonably understood that yesterday's matchup, already viewed by many as a last perfunctory hurdle before The Game, cause many in the Michigan fanbase and brain trust to worry about "What does this mean for next week?" It's a reasonable question, but it's also one that ignored that Ohio State looked eminently ordinary against Maryland in the early game slot. This game likely has little meaning for next week, save the notion that Michigan has some nice "don't do this" film and got some practice against a team that likes to tempo. Indiana is in the books for another year (thank goodness. We'll do it all again in Bloomington before OSU next year.) The Game is here. Beat Ohio State. For many years, I thought that the next line in "A Murder of One" (one of my favorite Counting Crows songs) was "There's a perfectness inside you" which not only made sense, it seemed like a nearly magical turn of phrase from Adam Duritz. It turned out that it was "There's a bird that nests inside you." which is still pretty good, but not as good as I initially believed my false impression to be. It makes more sense with the bird metaphor that continues afterward, but again, the notion of a perfectness inside you, sleeping underneath your skin always seemed like this wonderful notion of what can be achieved if we just pushed ourselves a little more. What Michigan did to Penn State today was nigh on perfect. It obviously did not finish as perfect as Penn State scored a garbage time touchdown, preventing the Don Brown shutout dreams from coming true, but still, it just felt amazing. It was just brilliant. Even though the script felt familiar, not enough points in the first half, potential missed opportunities, blood in the water being ignored, we also knew how that script flipped in the second halves of the last two games. If I'm going to be honest, writing about these kinds of games are difficult because they're works of art. They stand on their own. Each of us stands before the artwork, taking it in, processing our own experiences, our own feelings, our own personal aesthetic and comes up with something. If we're skilled in communication or in the history of the medium, we can usually articulate why this particular thing makes us feel this particular way, but sometimes the sheer joy or exhilaration of the piece robs us of our words. We look at it and words fail us. This was a pure, unadulterated cackle with glee moment. Chase Winovich has said a lot of things. He has said many many things that would be worrisome if he was not out there every play, backing it up, leading the posse like Kurt Russell's Wyatt Earp in the last hour of Tombstone, and riding herd like he knows the exact amount in his bank account so he can start writing checks all over the Big Ten. I am sure that he annoys the hell out of the rest of the Big Ten and probably the country, but I don't care. 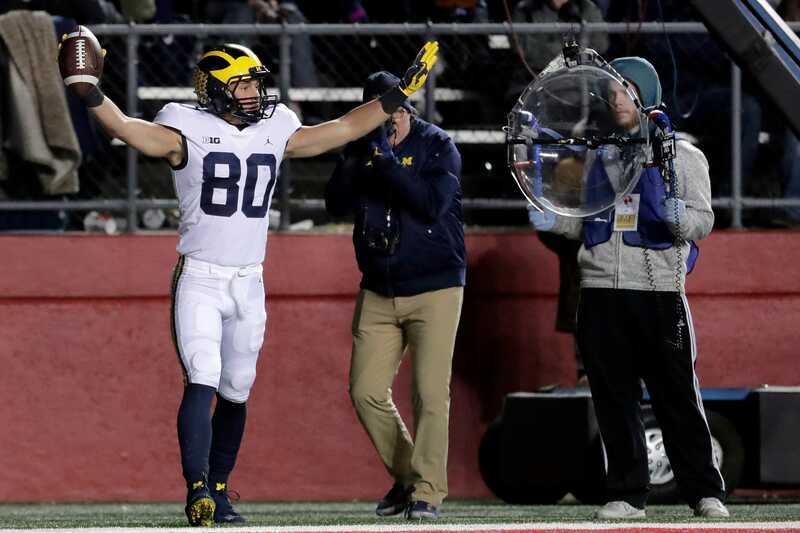 The guy who can destroy opposing quarterbacks but still take time to let the Drama Department know that he really enjoyed their performance of Sweet Charity, he's the Winovich, and we love him. A trip to New Jersey next week awaits. Onward.